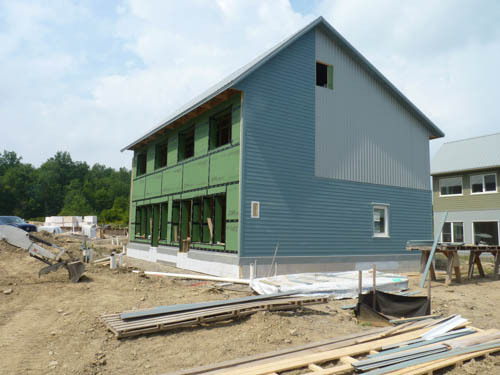 A third neighborhood at EcoVillage at Ithaca includes the largest cluster of Passivhaus certified single-family houses in the U.S.
One hundred new units of housing are being built at the EcoVillage in Ithaca, New York. 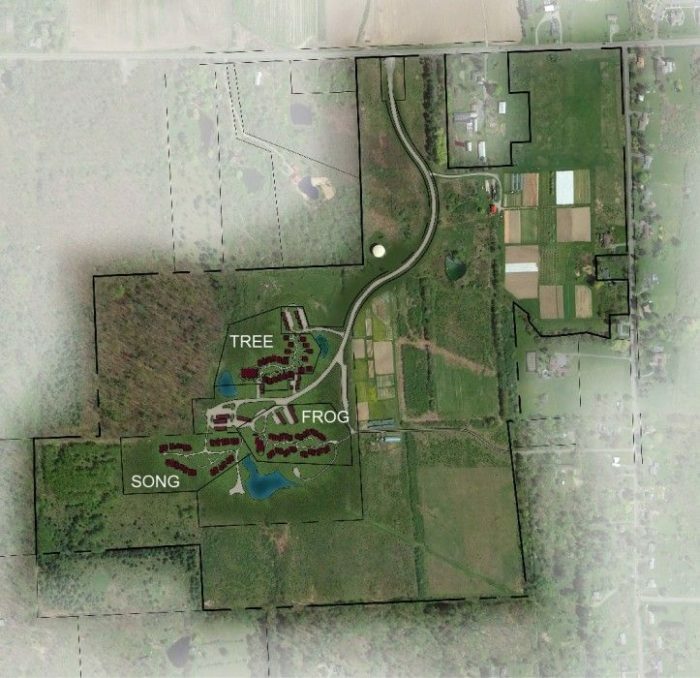 Most of the development's 175 acres of land have been reserved for gardens, woods, ponds, and hiking trails. Image Credit: EcoVillage Three adjoining neighborhoods make up EcoVillage at Ithaca. The first opened in 1996. Each of the neighborhoods has a nickname: FROG, SONG, and now TREE. Image Credit: EcoVillage Simple exteriors have helped keep costs low. Although they are built to Passivhaus or near-Passivhaus standards, the houses, duplexes, and apartments are selling for about the market rate. 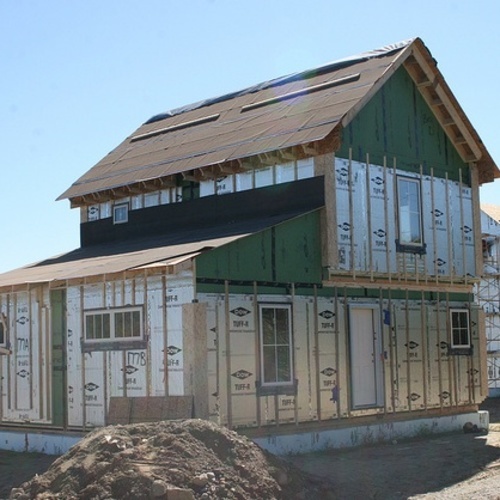 Image Credit: EcoVillage Double-stud walls are 12 inches thick and insulated with a combination of spray polyurethane foam and dense-packed cellulose on houses certified by Passive House Institute U.S. On non-certified buildings, the spray foam was omitted. Image Credit: EcoVillage The last building under construction is the four-story common building at TREE, which should be complete by August. Its upper three floors are set aside for apartments. 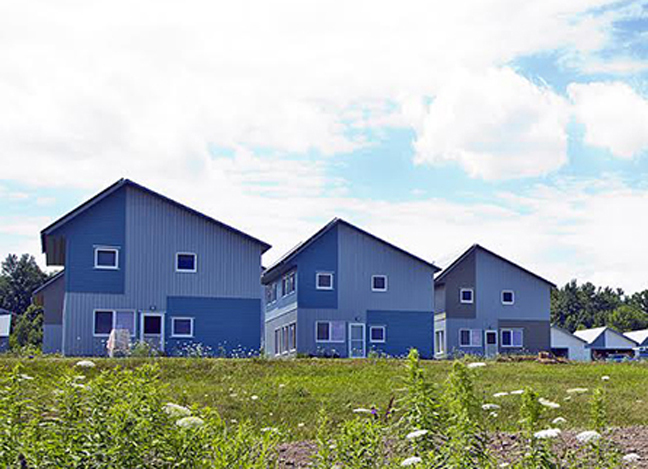 The third of three cohousing neighborhoods on a 175-acre tract of land in Ithaca, N.Y., is nearing completion, and every one of its 40 apartments, duplexes, and single-family houses was sold before construction began. The new neighborhood is called TREE, for Third Residential EcoVillage Experience. 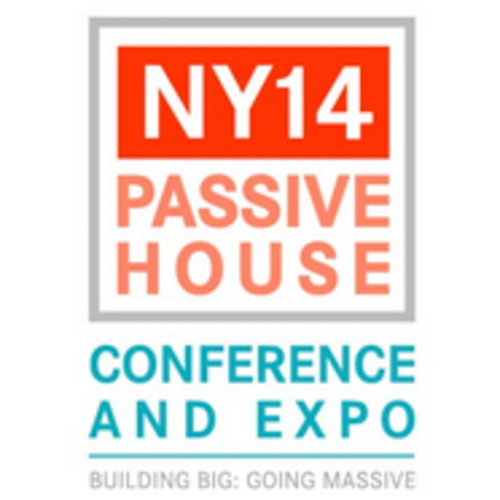 It will include seven houses certified by the Passive House Institute U.S. (PHIUS), perhaps the largest cluster of PHIUS-certified single-family homes in the country. The balance of 33 apartments and houses are built to nearly the same standards. In all, the three clusters of homes comprise EcoVillage at Ithaca, home to about 150 adults and as many as 75 children, their ages ranging from 2 months to 82 years. The first neighborhood built at the co-housing development was completed in 1996, and although early organizers had originally envisioned a total of five neighborhoods, TREE may be the last. TREE consists of 17 single-family homes, four duplexes, and 15 apartments on the upper three floors of its central community building. In addition to having some of the houses certified by PHIUS, the community has been certified under the U.S. Department of Energy’s Zero Energy Ready Home program. As GBA’s Richard Defendorf explained in a 2011 article, EcoVillage at Ithaca is a cohousing community, one of 240 such projects listed at the time in a national online directory. Each of the three neighborhoods making up EcoVillage at Ithaca are designed to promote community and cooperative decision making. Houses are clustered to encourage people to meet their neighbors, unlike conventional residential developments that tend to isolate people from each other, Jones said. Residents themselves handle community chores that otherwise would be farmed out to paid tradespeople. It’s proved attractive to people far beyond Ithaca. Jones said that new residents for TREE have come from Indonesia, California, Canada, and Italy as well as the Ithaca area. There’s also an educational element to the community. 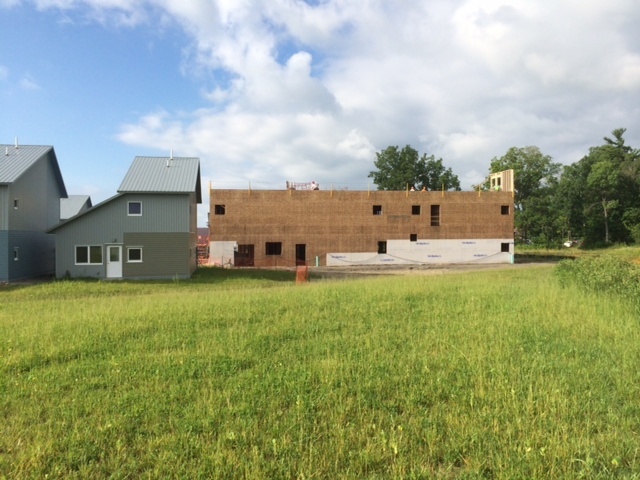 EcoVillage co-founder Liz Walker said that a recent two-day training event on net-zero building attracted 29 green builders, architects, and engineers from New York State and Vermont. Another session is likely in September. The slab-on-grade houses in this Climate Zone 6 locale are built with double-stud walls using efficient framing practices for about $100 a square foot. They have “very simple exterior designs and interior finishes,” according to a DOE fact sheet about the project. Foundation: Beneath the slab, 5 1/2 inches of foil-faced polyisocyanurate foam (R-36) over a 6-inch layer of gravel and a 6-mil polyethylene vapor barrier. The frost-protected shallow footings are 24 inces below grade and insulated with foil-faced polyiso. Exterior walls: Two 2×4 stud walls, with studs 16 inches on-center, are 5 inches apart, creating a total wall thickness of 12 inches. 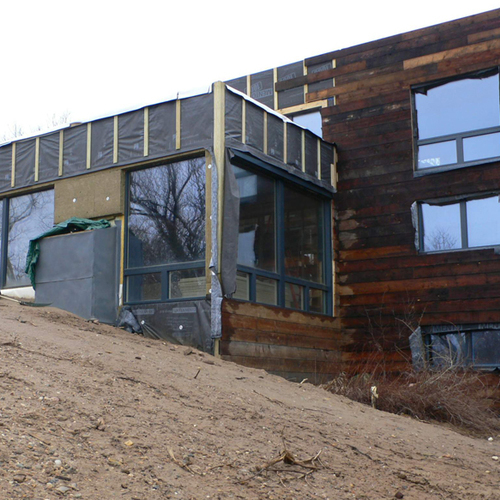 Walls are sheathed with Huber’s Zip system OSB, the seams sealed with tape. The inner surface of the sheathing is insulated with 3 1/2 inches of closed-cell polyurethane foam and the rest of the cavity filled with blown-in cellulose, for a total wall R-value of 52. Exterior cladding, a mix of metal and fiber-cement lap siding, is applied over a rainscreen gap. Roof: The roofs are asymmetrical, with a longer, lower-pitched side facing south for solar panels. Roofs are framed with raised-heel trusses and insulated with blown-in cellulose to R-90 (spray foam was also used on north-facing roof slopes because of their shallower design). A layer of taped OSB applied to the bottom chords of the trusses makes the air barrier, with the gypsum drywall ceilings installed over 2×4 furring. The metal roof is installed directly over the trusses without any sheathing. Windows: Tripled-glazed Intus units with a whole-window U-value average of 0.16. Ventilation: Energy recovery ventilators, running continuously. Air conditioning: None, unless specifically requested. Domestic hot water: Solar thermal for preheating, with electric-resistance backup. Lighting: A mix of LEDs (72 percent) and compact fluorescents. Airtightness: The PHIUS-certified houses are all below 0.60 air changes per hour at a pressure difference of 50 pascals. Non-certified houses are around 1.5 ach50. Renewable energy: A ground-mounted, 50 kW photovoltaic (PV) array will help power the TREE common house. Of the remaining 25 houses in the neighborhood, more than 80 percent will get PV panels. Lois Arena of Steven Winter Associates, the Passivhaus consultant on the project, said that the certified units include five single-family homes and one half of two separate duplexes, or seven units in all. There are two differences between certified houses and those that aren’t, she said. 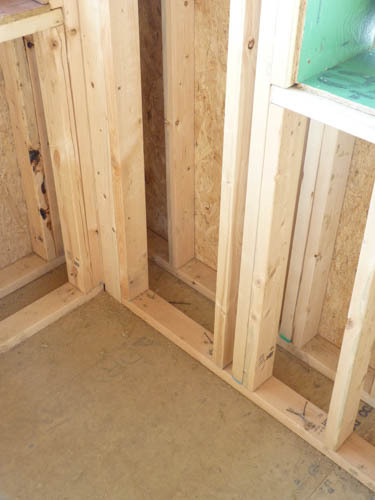 Certified houses have extra detailing in the attics to increase airtightness, and have spray foam in the exterior walls for slightly higher R-values. (Walls in the non-certified houses are filled completely with dense-packed cellulose). High levels of insulation and virtually airtight construction might seem to make ductless minisplit air-source heat pumps a slam dunk for both heating and cooling. But in this case, Jones said, they didn’t make as much sense as simple electric-resistance heat. One big reason: Mechanical air conditioning isn’t a necessity on the hilltop site. Instead, residents typically open windows at night and close them early in the morning, which flushes warm air out of the house and replaces it with cool nighttime air. The superinsulated walls and roof keep the house comfortable during the day. Box and ceiling fans also help. Some accommodation can be made, he added, for a resident who needs air conditioning because of a health problem. Two others strikes against the minisplit option was the eventual need for maintenance and repair, and the noise the outside compressors would make, however slight. Prices range considerably, depending on the size and location of the units. A studio apartment in the common building at TREE, for example, costs between $80,000 and $100,000, while one of the larger single-family homes, a 1,600-square-foot, three- or four-bedroom model, went for between $240,000 and $280,000, according to Jones. That’s comparable to other housing in Ithaca, but EcoVillage residents also get the use of common gardens and workshops as well as access to a lot of open land. DOE said that added construction costs over houses built to the 2009 International Energy Conservation Code amounted to about $20,000 per unit. 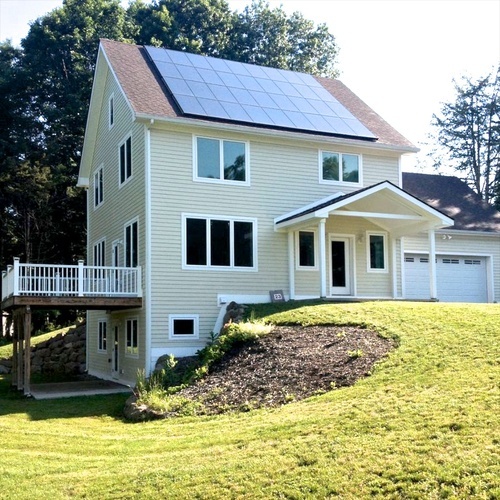 Annual energy cost savings, compared to a house built to the 2009 IECC, was $2,928 for a house equipped with PV panels. Projected annual utility costs are $1,593 for units without PV, and $628 for units with PV. I first reported on this community in a December 2003 article I wrote for Energy Design Update (see attachment below). It's interesting to see how the community's construction methods have evolved over the years -- from early efforts that included too much south-facing glass, to experiments with district heating, to the use of ICFs and SIPs, to the current project that uses double-stud walls and electric-resistance heating. Nice job. It seems there is hope. Interesting choice not to use mini splits. When the numbers are run, PV beats heat pump these days. They also mention "complexity" and noise and repairs. Those factors should be brought to the fore in our times. Complexity is wearing on us. Our housing needs to be both simple and sufficient...and quiet! Next: I am a little surprised that the utility bill on the units with PV is still $628 year. That is over 3000 kwh even at 20 cents kwh. What are they running? Is it the electric heating? Must be, but considering the insulation values, still a little surprising. Nicely done. My only criticism is that the buildings look like typical low income housing projects from the 60's. Pretty ugly. Interesting to see no mini splits. My experience with Mitsubishi and Fujitsu mini splits is that the outdoor compressor is dead quiet. I can't even hear them running unless you walk right up to it and even then it's a slight fan noise. They are NOTHING like old school A/C units. Minis are also very reliable. Mitsubishi has a 5-year+ warranty and they are maintenance free and one can install a 1 ton unit that gets 30 SEER for around $3k. Nice to see Intus Windows being used again in these projects. They are the best bang for buck triple pane uPVC window out there. A lot of projects are using them.